Opened 24/7, Serves Breakfast, Lunch & Dinner, Ala-carte Menu available 24/7. 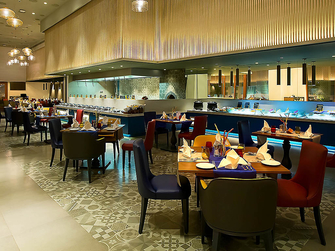 La Uppu is an innovative trendy all day dining restaurant for all travelers and diners with expansive buffets offering global gourmet cusine, live interactive kitchens and fun filled weekend packages coupled with entertainment and an extended brunch. 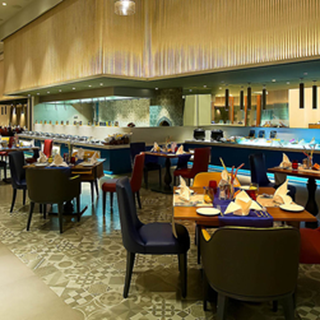 La Uppu is open 24/7 providing luxuriate top quality, fresh, flexible and pure food and beverage options. La Uppu provides friendly, quick and discreet service with Local touch. The food and service is very nice. Staff is friendly and very welcoming !!! Saquit from front reception - so patient and so kind. Madhu from La Uppa - so kind and she made our stay fantastic. Such a delight each morning to talk to. Shankar CH from La Uppa - very very helpful and such a lovely attitude. Liddy from La Uppa - he went above and beyond our expectations. So professional and made our New Year's Eve great. Ritupon from house keeping. He cleaned our room and really took care of us. Nothing was too much trouble for him and it was grately appreciated. Everyone was wonderful but these people made our stay exceptional. Thank you we enjoyed our stay.